This is one of those recipes that has been circulating around the interwebs for a while now. It seems there are several versions, and they're all very similar. Martha has one, Southern Living has one, and on and on. My problem with many of them is that they only use 12 ounces of pasta instead of the full pound. It's fine. I get it. If you add the full pound to your skillet, it won't all fit with the rest of the ingredients. But who cooks only 12 ounces? I don't know about you, but I always cook the whole pound. So I figured, why not just use a bigger pot??? Seemed like a no-brainer to me. My next issue with the other versions is that it doesn't really go very far. I mean, I wanted it to be enough to feed 4 people. So, I figured, let's add sausage to it! That'll help stretch it a little. And that's exactly what I did. And do you know what? It turned out perfectly!! It tasted great, everyone had plenty to eat, and I even had enough leftover for lunch the next day. And it's so easy, you just keep adding things to the pot! Simple! So you should definitely keep this recipe your repertoire. It's ready in less than a half hour so it's perfect for any weeknight dinner. It's also a great menu option for an easy casual dinner with friends. I got RAVE reviews for it. You will too! Definitely a keeper! Slice sausage into bite sized pieces and place in a pot along with the chopped onion and a few glugs of olive oil. Cook and stir over medium heat just until the sausage is slightly browned and the onions are cooked down a bit. Add all of the remaining ingredients except for the cheese. Cover pot and bring to a boil. Reduce to a low simmer and keep covered and cook for about 10 minutes, stirring every 2 minutes or so. Cook until almost all liquid has evaporated. Add the cheese and give it a good toss with the pasta. Season to taste with salt and pepper. Serve with more cheese and a few more chopped fresh basil leaves over the top. Feel free to use any kind of sausage you like. Pork, chicken, turkey, sweet or hot, even Chorizo or Andouille. Any kind will work! Not a fan of sausage? Just leave it out! That makes it even easier. You just throw everything right into the pot, bring it up to a boil and then simmer as directed. Done. You can use vegetable broth or chicken stock instead of water, but water works just fine. Ok, I know, I know. I've been posting a lot of strawberry recipes, lately. What can I say? I love strawberries! The Strawberry Cupcakes, the Strawberry Cream Cheese Cobbler, the Mixed Berry Bundt Cake. All fabulous, I must say. But here's the thing: Sometimes I plan for a month of one ingredient (you know, like, the way I always do a month of pumpkin recipes in October), but this time I really didn't plan for a month of strawberries. It just kinda happened. And by the third week, I figured, ok, well, I guess I might as well go with it! So here we are again with another fabulous strawberry recipe. I found it on a website called Liz the Chef, and I believe it was a tweaked version of a recipe she found in Bon Appetit magazine. Of course, I couldn't leave it alone, and I tweaked it even a little bit further, so this is my tweaked version. It's delicious and moist and it's so easy, you don't even need a mixer. I also like the fact that it makes a simple one layer cake, which is perfect if you're not feeding a crowd. So now we can add this to our fabulous strawberry repertoire. And why not?! More is more! Enjoy! Spray a 9x2" round baking pan with baking spray*. Using a large bowl, whisk together the flour, sugar, baking powder and salt. Using a medium-sized bowl, mix together the eggs, ricotta, vanilla, and lemon zest until smooth. Fold into dry ingredients until just blended. Add the melted butter, stir, then gently fold in 1 cup of the berries. Pour batter into cake pan and scatter remaining berries on top. Bake until golden brown or until an inserted toothpick comes out clean, about 45-50 minutes. Allow to cool in pan 20 minutes before turning out on a plate. Garnish with confectioner's sugar and serve. *Be sure to use BAKING spray, not just regular vegetable oil spray. The baking spray has flour in it and takes the place of greasing and flouring the pan. The lemon zest gives it a bright flavor, but if you're not a fan of lemon, you can just leave it out. On the flip side, if you LOVE lemon, then go ahead and add the zest of a whole lemon instead of just a 1/2 tsp. You could also use orange zest in place of the lemon. YUM! I bet this cake would probably be AMAZING with blueberries, or any combination of berries! So I recently made a huge batch of bumbleberry jam, (which was FABULOUS, btw) and I had quite a few berries leftover. Hmm.. what can I make with them? Sure, I could make a pie, or a Strawberry Shortcake, but I wanted something new. Oh! How about something light and no-fuss that I could bring to an all-day rehearsal for the show I'm currently doing? A bundt cake! Yes, That's the answer. And off I go, looking for the right recipe. Well, it didn't take me long to find THIS one. It's from Williams-Sonoma, and it's PERFECT! It's simple to make, I already had all of the ingredients on hand, and it's absolutely delicious. And it was just the thing to bring to my rehearsal, no plates or utensils needed, and everyone could just grab a slice at any time throughout the day whenever they wanted. Everyone loved it! It would also be fabulous with a citrus glaze drizzled over it for any special occasion or even just an afternoon tea. Maybe next time I'll serve it with a little bit of the bumbleberry jam that I made! Boom. Preheat an oven to 325°F. Butter and flour a Bundt pan. In a large bowl, blend the eggs and granulated sugar. Using an electric mixer, beat in the butter and liqueur until fluffy. Add all but 2 Tbs. of the flour and the baking powder and salt, and beat until well incorporated and no lumps remain. In another bowl, combine 1 1/2 cups of the raspberries and the blueberries with the remaining 2 Tbs. flour. Toss to coat the berries evenly with the flour. 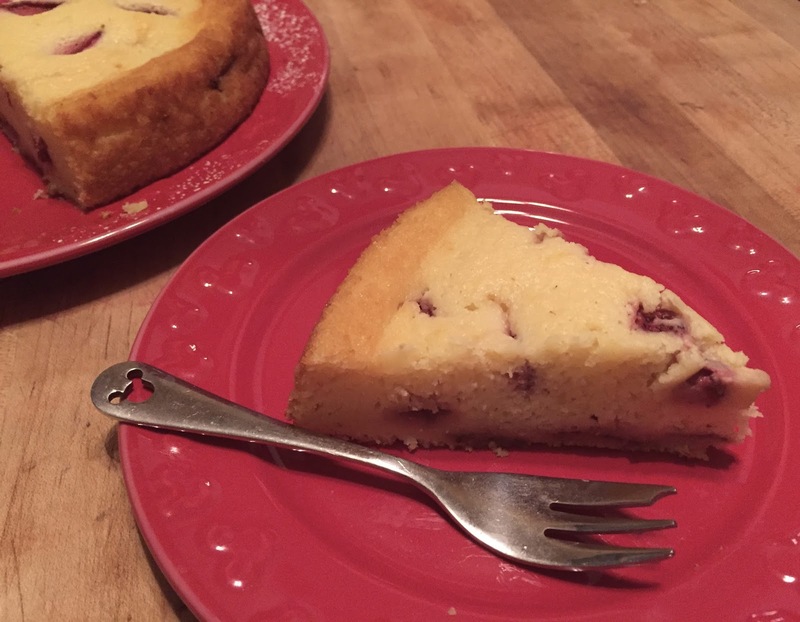 Using a rubber spatula, gently fold the berries into the batter. Pour the batter into the prepared pan. Bake until a wooden skewer inserted into the center of the cake comes out clean, about 1 hour. Transfer the pan to a wire rack and let the cake cool in the pan for 20 to 25 minutes. Unmold the cake onto the rack and let cool completely. Fill the center of the cake with the remaining 2 cups raspberries. Dust the cake with confectioners' sugar. I listed the recipe the way Williams-Sonoma did, but I didn't do it exactly the same. For one, I didn't have raspberries, I had strawberries. So I just diced them up to about the same size as the other berries. I also didn't serve mine with two cups of berries in the center. So be sure you only put a total of 3 cups of berries in the cake batter. I say this because I almost threw all 5 cups of berries into the cake and then realized that 2 of the cups were intended for garnish. Whew! That was a close one. Serves me right for not READING the entire recipe as I'm making it. LOL ah well. Live and learn. If you're one of my faithful readers, you know that I'm always searching for new red, white, and blue recipe ideas for July 4th. It's just how I was raised. On the 4th of July, you wear red, white, and blue, you cook red, white, and blue, it's just what you do! So anyway, I happened upon this recipe, I guess it was maybe a year or two ago, and just never got around to posting it. It was from a Youtube channel called Hands That Cook. (Actually, the woman who is doing the cooking in the video said she got the recipe from the internet, but like I always say, since she's the one who gave it to me, then she's the one who gets the credit!) It's really SUPER easy, so a novice cook can whip this up in no time. Like, seriously, you don't even need a mixer! And if you serve it with whipped cream and blueberries, Boom, there's your red, white, and blue! It's the perfect thing to bring to a BBQ, and I KNOW your friends and family will thank you for it! Enjoy! Pour melted butter in a 9x13 pan. Set aside. Whisk together all other ingredients except cream cheese and strawberries. Pour batter over melted butter. Do not stir. Arrange whole strawberries in one layer. Dot with small chunks of cream cheese over top. Bake 45 minutes or until golden and set. Serve with whipped cream and blueberries, if desired. The pan I used was just a tiny bit smaller than a 9x13 pan, but it still worked beautifully. Just use as many strawberries as you can fit in one layer in the pan. I'm sure you can use this recipe for any fruit you like! How about peaches? Or blackberries? Or maybe a combination of fruits like raspberries and blueberries! OH how about chunks of fresh pineapple?? I bet they'd go great with the cream cheese. YUM. I'm gonna have to give that one a try!